Published on Palestine Chronicle January 2004 and lots of places after that. The Jewish colonisation of Palestine under the Zionist slogan ”the land without people to the people without a land” started almost a hundred years ago and reached its first climax with the proclamation of The Jewish State of Israel in 1948. A second climax is now in the offing through the ongoing colonisation of the West Bank and Gaza. There is a law in Israel, passed in 1985, which forbids political parties to openly oppose the principle of a Jewish state. Neither are they allowed to work for a change of this principle through democratic means. A party so doing will be banned from elections to the Knesset. Democracy is thus denied to those citizens – even Jews – who wish to work within the parliamentary system towards replacing the Jewish state with a secular state which represents all its citizens’ equal rights regardless of religion or ethnic origin. This law alone prevents Israel from being seen as a liberal democracy of Western type. Other laws and administrative regulations emphasize Israel as a Jewish apartheid state. Israeli ID cards indicate whether the holder is Jewish or not and Jews in Israel may not marry non-Jews. Non-Jewish Israelis cannot purchase government-owned land. Many Arab villages in Israel are not zoned as residential areas, as a result of which they have no access to public services such as electricity and water. The disqualification of most Arab Israelis from military service reinforces discrimination as regards social b enefits, education and the like. In Israel/Palestine today, there are three apartheid classes of people. Jews are fully qualified citizens of Israel, the West Bank, Gaza and the whole world. Non-Jews in Israel, mainly Palestinians (20 percent) are second class citizens. Palestinians are stateless non-citizens on the West Bank, in Gaza or in refugee camps in neighbouring countries. Israel continues to violate international law and commit crimes against humanity. They have conducted genocide against the Palestinians for a hundred years. When Israel became a member of the UN in 1949 an objection was raised regarding a previous UN demand that the refugees be allowed to return home at the earliest possible date and that they should receive full compensation for property, according to international law and practice. For 55 years, Israel has completely ignored this demand. On these grounds alone Israel could be expelled from the UN. No other state, saving Israel, has so completely ignored so many UN resolutions. Israel is a military superpower with nuclear weapons and took active part in the US and England’s war against Iraq. Without any provocation, Israel recently bombed targets in Syria and armed its fleet with nuclear weapons. Previously they attacked Egypt and Lebanon amongst others. How could this evolve? What is the ideology behind this very special project of colonialism, the only one that has survived two turns of a century? What sort of ideology is Zionism? Colonising Palestine continues today on the West Bank and in Gaza according to the practical plan presented by Theodor Herzl in his book ”The Jewish State” (1896). The book is mainly about how the project could be financed and how land in Palestine could be transferred to Jewish ownership. The plan was affirmed by the first Zionist Congress 1897. Herzl had some important starting points for the Zionist Project. Anti-Semitism cannot be remedied by the assimilation of Jews. Jews are a race of people with a right to their own state. Palestine (or Zion) is the home of the Jewish State. The goal is a socialist Utopia – a model state. The term Zionism was, however, conceived by Nathan Birnbaum in 1885. Together with Herzl he made up the leadership of the Zionist World Organisation. Later on he became a spokesman for Judaism in the Diaspora – outside Israel/Palestine. The fundamental ideology of Zionism however evolved much earlier with Moses Hess. He was one of Germany’s earliest renowned Socialists. He was a Utopian, a Hegelian and a good friend of Karl Marx. Hess also wrote a contribution to The Communist Manifesto (1848) on the question of Religion as opium to the masses. He is considered by Zionists as the first Zionist. As he grew older he dissociated himself from Marx and ”returned” to his People, that is to say Judaism. Marx shunned Hess’ chauvinistic ideas. ”Communist Rabbi Moses” as he was also called, wrote Zionism’s Magnum Opus which Herzl later referred to as the book which says everything there is worth saying about Zionism. The Jewish religion – the best guarantee for Jewish nationality. The importance of Blood in defining racial purity was common at that time and was also part of Hess’ conception. He saw the German race as antagonistic to the Jewish race. He worried about the antisemitism apparent in Germany at that time and this was his main reason for ”returning” to Judaism. For him, Socialism, apart from developing equality of the classes must also develop a moral dimension. The Jewish State should have the makings of a Socialist State. Hess predicted both the foundation of the State of Israel and the Holocaust 80 -85 years in advance of these occurrences. Hess considered France to be the foremost ally of the Jews. This was before the Dreyfus trial in France which came to be the one event that convinced Theodor Herzl that Zionism was the only solution to anti-Semitism. After the first Zionist Congress, the renowned Marxist Ber Borochov developed the rigorous policies of the Zionist Project. He argued territorial concentration as a solution to, among other things, the Jewish question. He founded Poalei Zion, the Marxist Zionist Party which supported the Russian Revolution in 1917. David Ben Gurion, one of the Party members and Israel’s founder, came to Palestine at the beginning of the twentieth century. He considered himself a Bolshevik and was in favour of the dictatorship of the proletariat in all countries, except Palestine where he favoured the dictatorship of Zionism. Ben Gurion considered Jewish national interests superior to class interests in Palestine: a clear case of unmitigated National Socialist leanings. When the Poalei Zion split up, Ben Gurion became the leader of the Social Democrat wing and was influential in Zionism for years to come. The colonisation took place in the name of Socialism and the enlightened culture of the Western World. Under the forceful leadership of Ben Gurion the colonisation proceeded in stages while upholding negotiations with the Palestinians. The foundation of the Jewish state could wait. The first issue was the building of a strong army (Hagana), which could drive the Palestinians out and create and defend a substantial Jewish majority on as large a part of Palestine as possible. The strategy was very successful. Israel was proclaimed in 1948 on land which geographically comprised almost 80% of the whole of Palestine: a considerable increase to the UN Partition plan which offered Jews 55%. Today Israel has seized all of the original Palestine, while the Palestinian villages are now surrounded by The Wall, cut through by motorways – only for Jews – and interspersed with hundreds of check points and fortified Jewish settlements. A minority within Zionism, represented by Zeév Jabotinsky wanted immediate action. In 1925 he founded a Zionist revisionist movement. In the article ”The Iron Wall” (1937), he stated, among other things, that all native people are against colonisation, even the Palestinians. Colonisers must therefore use the utmost determination to show that opposition does not pay off. The above mentioned are the two main standpoints within Zionism which have also, during different periods of time, served as the official ideology in Israel. Interwoven in these and of varying importance, are other movements such as practical Zionism, radical messianic Zionism, religious Zionism, spiritual/cultural Zionism and more. While Ben Gurion sympathised with Marxism and later on with Social Democracy, Jabotinsky sympathised with Fascism. He admired Mussolini who supported him. Jabotinsky died in 1940 before the proclamation of The State Of Israel. He founded the Jewish terror organisation Irgun which committed its most horrible deeds during the expulsion of the Palestinians. The Lehi, a splinter group headed by Stern, murdered Folke Bernadotte who was the UN representative and mediator. The man who pulled the trigger became Ben Gurion’s good friend and security guard when he retired to the kibbutz Sde Bocker. The leaders of both organisations — Menachem Begin and Yitzhak Shamir — later became Prime Ministers of Israel. It is remarkable how similar the two Zionist standpoints are in practical politics. The Iron-Wall policy is now being completed by Israel’s present Prime Minister, Ariel Sharon, with greater military force than ever before. Sharon belongs to the same right-wing group as Begin and Shamir (Likud). However it was the governments lead by the Social Democrats that started and completed most of the considerable expansion of Jewish settlements on the West Bank and Gaza. The Eastern European Jews, who were Marxists, stamped their mark on the colonisation of Palestine during the first half of the twentieth century. Collective farms – the kibbutz – were the main instrument in bringing it about. They were democratic, socialist, experimental units, often secular. No money was in use and the collective upbringing of children was common for a long time. Only Jews were allowed to be members. The seemingly racist kibbutz played an important part in the capture and military defence of occupied territory. The settlements of today on the West Bank and in Gaza serve a similar purpose, though they are religiously orthodox. A Zionist leftist ideology dominated in the beginning. As shown above this can also be seen as Jewish National Socialism, upheld by Ben Gurion. After the occupation of the West Bank and Gaza in 1967, a Zionist right-wing ideology, like Jabotinsky`s, has dominated. The Israeli ”left” of today is predominately left-wing Zionism. Within Zionism’s two main standpoints there has been interaction. Thus left-wing Zionism has targeted policies for the settlements, while the right-wing has been responsible for terrorism and ethnic cleansing. After 1967, the religious influence on Israel’s politics has grown. However, religion has always been important in Zionism. Nowadays in Israel, religion and politics have merged. Classic Judaism (and orthodox of today) has its roots in the Jewish societies in Europe of the Middle Ages. Zionism has given it a boost. Its antagonism towards non-Jews and the opinion that Jews are God’s Chosen People has great impact on Israel’s policies towards the rest of the world. According to Halachah, classic Judaism’s laws and customs, for example ”compassion towards others” extends to Jews only. Murder or manslaughter is judged mildly when the perpetrator is Jewish and the victim a non-Jew. Also according to Halachah, it is accepted for a Jew to kill a non-Jew if he is laying claim to ”eternal Jewish land”. This is what the settlers’ religious organisations are alleging. There is no corresponding law in Israel’s judicial system but in effect it influences the system as punishment of such crimes is very mild. Israel’s state terrorism, theft of land and occupation, demolition of houses, the building of the Wall, etc., including the so called ‘extra-judicial killings’ (assassinations), are seen by Zionists as legitimate defence of the Nation and therefore fall under international law – which Israel ignores. Israel Shahak discusses the influence classic Judaism has on Israel’s policies in his book ”Jewish History, Jewish Religion” (1996). For a long period of time Shahak was chairman of Israel’s Society for Human and Civil Rights. He is especially critical of the double moral standards kept by prominent left wing intellectual Jews, particularly Martin Buber, the well known philosopher. Buber criticized Nazism while commending the Jewish Religion (Hassidism) but keeping quiet about its dehumanising of non-Jews (goyim). These double standards act to increase Israel’s chauvinism and hatred of all non-Jews. Israel’s Peace Movement has been accused of harbouring similar sentiments. Many countries which think of themselves as modern, attempt to do away with religious thinking from the Middle Ages, mainly by the separation of Church from State and laws against racism. The opposite has occurred in Israel. The revival of classic Judaism in Israel’s politics can be seen as an expression of Zionist expansion, thus increasing opposition to the Palestinian Arabs. Had the Jews, some 75 years ago, chosen a bi-national democracy for their national sovereignty, there could have been peaceful development of the English Mandate for Palestine. The Mandate was partitioned by the UN in 1947 even though this meant the further extension of land already colonised. Judah Magnes, head of the Hebrew University in Jerusalem, advocated bi-nationalism, as did Folke Bernadotte, the UN mediator. A Jewish nationalism which acknowledges the Palestinians right to national sovereignty is more in keeping with Judaism’s long tradition of humanity and ”Jewish Enlightenment”. But the Zionists under their leader Ben Gurion demanded a Jewish State in no less than the whole of Palestine. The next opportunity Israel had to achieve a peaceful development was the Oslo Agreement. The Palestinians accepted a Jewish State on 78% of land that was the original Palestine in return for the development of their own State on the remaining 22%. But the Zionists turned down this generous offer. Israel has thus repeatedly rejected solutions which could have insured Jewish national interests and given them international recognition. Instead of this, Israel has chosen a policy which runs the risk of shattering The Jewish state. The logic of this can not be understood without taking into consideration classic Judaism’s close connection with Zionism. Moses Hess put together the fundamental components Race, People, Nation and ”the Chosen” to make a National Socialist version of colonialism. It was later to be known as Zionism. Hitler, 60 years on, put together the same components in Mein Kampf and formed his National Socialist Party. Hess’ opinions about the ”purity of the Jewish race” correspond to Hitler’s belief in ”the pure Aryan race”. This is extreme chauvinism based on the theory of the connection between ”Blood and Soil”. Despite the similarity of ideological structure, there are differences in constitutional and organisational structures. The same goes for similarities to the former apartheid State of South Africa. Family ties (Blood ties) are however still basic to Jews all over the world and in the Jewish state of Israel. A person with a Jewish mother is defined for religious purposes as a Jew, according to the Jewish Community in Stockholm, even if he considers himself an atheist. Jewish religion and family ties today are interwoven at a personal level, like religion and politics are in Society as a whole, as shown above. ”I too, like Hitler, believe in the power of the blood idea”, Chaim Nachman Bialik writes this in ”The Present Hour” (1934). Bailik is Israel’s most acclaimed poet. Had it been 10 years later he would probably have chosen to refer to Moses Hess, or kept quiet on the matter. Bialik’s sentiments on the enigma of the Blood can also be found in the above mentioned Martin Buber’s book ”On Judaism” (1967). Israel is not only a traditional colonial State with apartheid and racism, but also a Western imperialist fortress in The Orient. Zionism also means expansion and ethnic cleansing. Furthermore, it is an elitist ideology. It grows politically and religiously amongst the broad masses of people and is thereby strengthened. Religious totalitarianism is its ideological base with strong links to National Socialism and Fascism. The brutal violence, the intransigence and the dehumanisation of the Palestinians can only be understood against this background. Against this background, the genocide of the Palestinians is possible and consistent. It is the background against which Israel is a ”time bomb” in the Middle East policies of the US. It is high time Zionism and its Jewish State was replaced by a secular parliamentary democracy with equal rights for all citizens regardless of ethnic or religious beliefs. The grounds for a system of apartheid and the occupation of the West Bank and Gaza would thereby disappear. This is a necessary, if not conclusive, requirement if there is to be lasting peace between Israeli Jews and Palestinian Arabs. Whether it results in one or two secular democracies is of secondary importance. A feasible strategy for achieving democracy in Israel/Palestine would be the start of a liberation movement where Jews and Palestinians could pull together similar to the ANC movement in South Africa. Those Jews and Palestinians who are already fighting Zionism should therefore be given support first. It is also high time Jews – both in Israel and elsewhere – started reforming the Jewish religion. The concept of Blood ties should be replaced by religious conviction, the idea of Jews as ”The Chosen People” should be rejected and Jews looked upon as people like everyone else. The current genocide must stop. First of all for the sake of the Palestinians but also for the Jews. It fires a growing hatred of Jews in large parts of the World. United Nations forces are needed to protect the Palestinians and worldwide sanctions of Israel should be maintained. About the author: Lasse Wilhelmson was born in 1941 in Sweden. Recently he signed an international petition of Jews who waived what they regard as the colonial right of return to Israel. Wilhelmson’s ancestors fled to Sweden from the Tsar’s pogroms during the 1880s. Wilhelmson lived in Israel for several years during the early 1960s. He is currently employed as a woodworking instructor in an immigrant neighbourhood on the outskirts of Stockholm. He has long been active in the labour movement, as well as the antiwar movement during the Vietnam era. Wilhelmson has been a member of his local city council for 23 years, including four years on the Board. He belongs to the Jews for an Israeli-Palestinian Peace in Sweden. 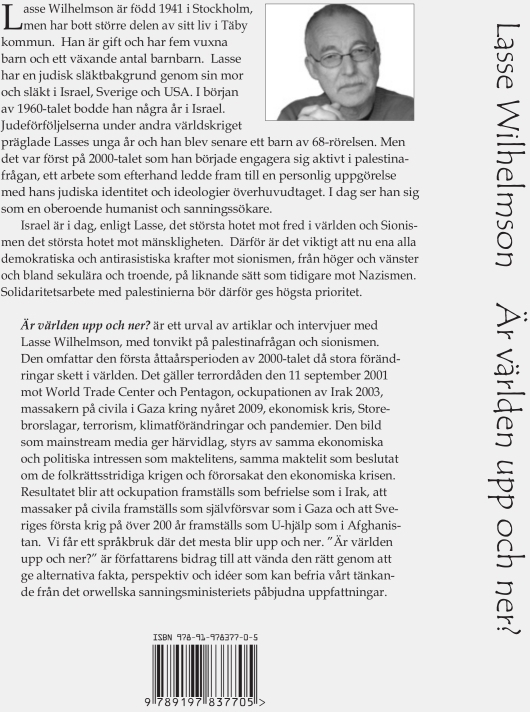 Wilhelmson also published the article ”Israel Must Choose the Path of Democracy” in The Palestine Chronicle the 16th of September 2003. 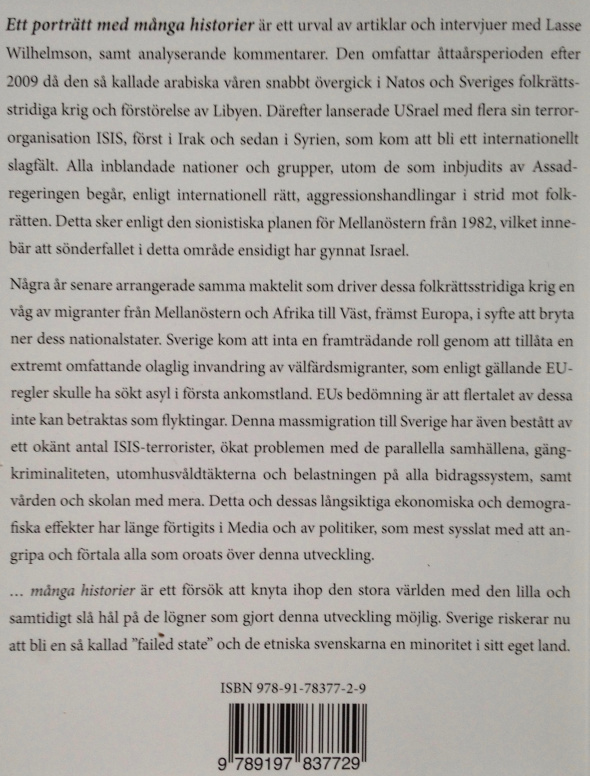 A somewhat modified version of that article was published the 3rd of June 2003 in one of the two biggest daily morning newspapers in Sweden – Svenska Dagbladet (independent conservative). Note: The author today (2013) has the opinion that it is up to the Palestinians to decide about what kind of state they want. However this article was written in a time, in fact ten years ago, when the autor in some ways identified as a Jewish Marxist. However that is not the case any longer, as can be seen in later articles by the author. The research behind and writing it was a turning point for him. Besides of this the article is still valid in most parts and in some parts it is still groundbreaking.